There are two helming positions either via the Wheel in the wheel-house or via the Tiller on Deck (which can also double as emergency steering if required). The vessel has a 48 volt bowthruster with dedicated batteries and remote control. Ensure to watch video of the owner explaining full detail of the rig and sail setup. The Gaff Ketch rig has keel stepped varnished Oregon Pine main and mizzen masts of hollow "birds beak" design manufactured by Nobel Masts of Bristol. The Booms are also of Oregon Pine by Nobles of Bristol. The Gaff Yards are hollow aluminium and painted to resemble wood. The Bowsprit is steel with a unique tensioning system. Both jib and staysail have electric roller reefing controllable from the Pilothouse. 900ft of Square sail also electric furled. Ensure to watch video of the owner explaining full detail throughout the boat. From the deck you enter the wheelhouse which is positioned just aft of amidships and slightly sunken below the level of the main deck. This provides ample headroom and also excellent all round vision from behind the wood spoke steering wheel. The wheelhouse, constructed of aluminium and clad in varnished teak, houses the chart table, comms equipment and a complete array of navigation equipment as well as an area for resting during longer passages. The companionway steps lead down from the Wheelhouse into the Galley/Dining Area. The Galley is positioned on the Port side and designed in a practical U-shape configuration, with plenty of preparation space. The Galley includes a double electric oven, 5 ring induction hob (with bespoke stainless-steel pan holders), and integrated microwave oven. Fitted into the teak worktop is a twin stainless steel sink with hot and cold running water. To complete the galley fit out are twin chest freezers, a front opening fridge and a full size domestic washing machine. On the starboard side is a large wooden dining table with plenty of space for seating 8 diners in comfort. Leading forward from the Galley/Dining area, through a separating door way is the Central Saloon. As with the Galley/Dining the Saloon has ample head-room and includes two leather settees positioned around a central wooden table. Against the interior bulkhead (leading to the Galley) is an electric flame-effect convection fire in a wood surround fireplace. The Saloon is bright and airy thanks to the roof that includes a large glazed hatch. Not only functional as a sky-light, this hatch also enables the saloon to double as a storage area for bulky items of cargo or the removal of the larger items of equipment and machinery fitted inside the boat. The Saloon includes copious space for storage as well as full length berths down both Port and Starboard sides. Leading further forward from the Saloon is the Forward suite that comprises the fore cabin and the forward heads. The fore cabin has a double berth under which there is access to the forward machinery space, the forward air conditioning plant and the bow thruster. The forward heads include a sea toilet and shower. There is an oil fired central heating system which heats everything including the Jacuzzi. Aft from the Galley/Dining Area is the spacious Master suite which includes a Queen size double, further separate berth on the starboard side, vanity unit and also a small library with a leather settee. At the end of the bed is a flat screen satellite TV. The Master suite also has a large en-suite shower room and is fitted with a generous shower and a continental style bidet. Also leading from the Galley/Dining Area is a Day Toilet with basin. This room also provides access to the engine and main machinery space. Heating is provided throughout the boat by radiators fed from an oil fired boiler. Air conditioning is provided by 4 Cruz AC units that provide cool air to the principal cabin spaces as well as ducting to the Wheelhouse. These units reversible so can either heat or cool. There are 2 main electric bilge pumps that service the engine room and the main bilge. These can also be directed to pump out other areas if necessary. The is a bilge level warning alarm system fitted. Make sure to view the videos taken with owner explaining details throughout the boat. Stepping aboard this boat and looking around the wide Douglas Fir deck she looked on first glances like an extremely well undertaken restoration of an old wooden classic fitted with traditional bronze winches and hatches and varnished teak table with comfortable seating for 8. Progressing into the wheelhouse and down the companionway into the stunning interior the vessel began to reveal her true nature. This is a bespoke yacht built to the current owner’s demanding specifications commissioned in 2012 as a luxurious fast blue-water cruiser that could be sailed by him alone or with one additional crew. 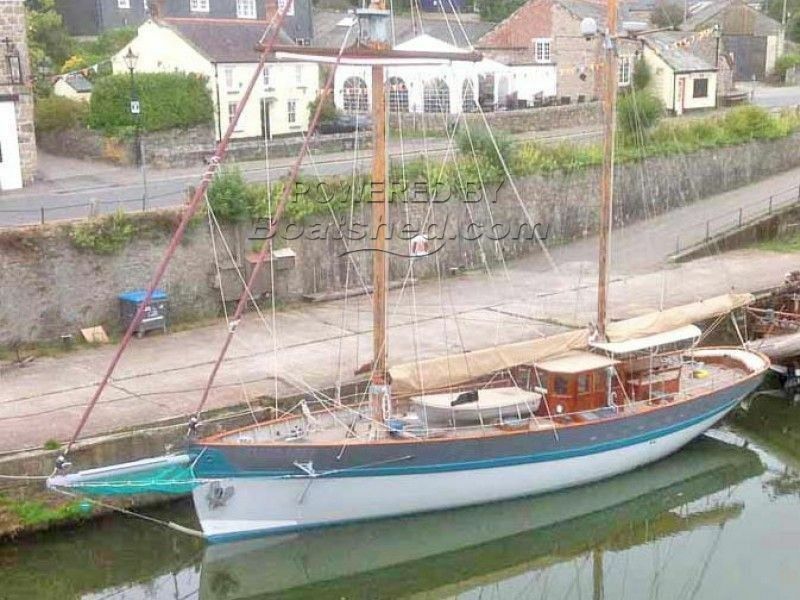 Her lines are of a design by the legendary French designer Francoise Lamcard in 1891 and she was built by a renowned Cornish Boatyard. A fast fine entry shape to give a sleek appearance despite a beam of 19ft. She is an extremely strong GRP construction built up with 14 layers of cloth either side of the keel and with 28 layers over the keel. Whilst retaining her traditional looks the gaff ketch rig uses some modern materials and equipment to make the boat more manageable by a short-handed crew. Her main engine is a Gardner 6LXB which is situated in an engine room that has ample space to undertake all normal maintenance tasks. The theme of accessibility to systems and machinery continues through-out the boat; the owner has carefully considered this aspect and all the main plant and machinery is easily accessible. The interior provides luxurious accommodation for the owner and guests and comprises fore and aft bedroom suites, a separate saloon with fireplace and central galley/dining area with fully fitted kitchen. There are four additional berths for crew or friends. Oil fired central heating system makes her lovely and cosy in the winter months. The deck is spacious and provides storage for a rigid tender and a seating area just aft of the wheelhouse. And one more thing, underneath a large lazarette hatch, just behind the emergency steering tiller, there is a Jacuzzi with the usual lights and jets - checkout the photograph's and video! Lifted and anti-fouled August 2018 including hull survey. This Pilot House Ketch - Luxurious Houseboat/Blue Water Cruiser has been personally photographed and viewed by Samantha Cassell of Boatshed Portsmouth. Click here for contact details.